Real Madrid stalwart Marcelo has addressed ongoing rumours that he could join Juventus this summer. As noted by the Daily Mail, the 30-year-old has been linked with a switch to Turin at the end of the season to set up a reunion with former teammate Cristiano Ronaldo. The pair enjoyed a successful spell together at the Bernabeu, linking up well down the left flank and building an impressive understanding, and so it’s easy to see why a reunion would make sense from Juve’s perspective. However, the Brazilian international appears to have thrown cold water over the rumours, as he insists that he has a contract with Real Madrid, which in turn would suggest that he isn’t thinking about an exit just yet. “We’re talking about a formidable team in Juventus, I remember that I followed them a lot when [Pavel] Nedved was playing for them and we also exchanged shirts,” he told Esporte Interativo, as noted by Calciomercato. 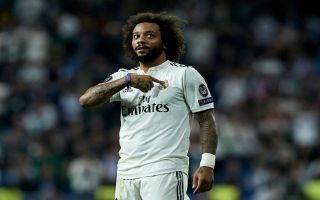 Marcelo has been in the Spanish capital since 2007, going on to make 475 appearances for the club while winning a whole host of trophies including four La Liga titles and four Champions League trophies. In turn, Real Madrid will surely have no desire to see him leave any time soon, while Juventus have Alex Sandro currently occupying their left-back role and so it’s questionable as to whether a swoop for Marcelo is even necessary. The Brazilian has continued to play a key role for the Turin giants in recent years, and so neither he nor his compatriot will surely be interested in facing such competition and uncertainty over a starting berth.